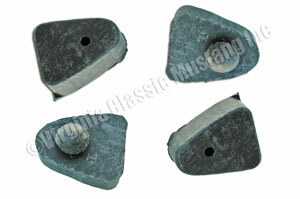 Quality molded rubber Mustang Bumper Guard Cushion Pads. Sold in set of 4. Fits on front and rear bumpers guards of 65-66 Mustangs and front only bumper guards (without rubber pad style) on 67-68 Mustangs.